I have conflicted views about Enid Blyton, but Thirteen O’Clock story is relatively free of the problems I (and many others) have taken issue with in these slightly more enlightened times. We still have a story in which a young patriarch-in-training helps an older female character out by tending to her minor injury and finding a lost cat, which some may read more generously as an example of feminine caring. All that aside, this was one of my most favourite books as a preschooler — that lady sure knew how to tell a tale to children. 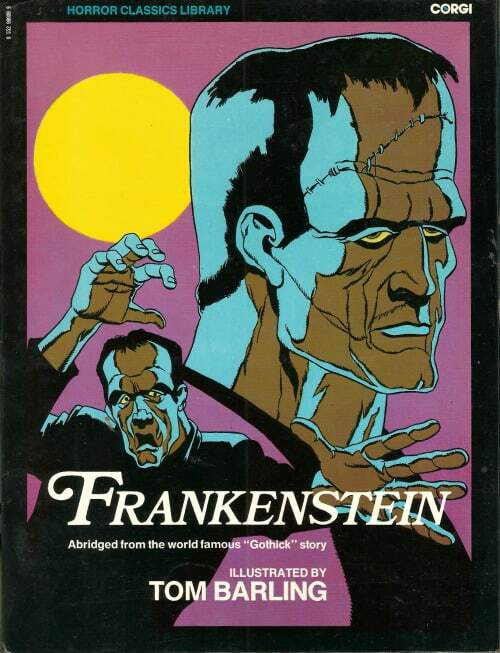 Mine is the 1974 version illustrated by Tom Barling in very 70s style. The story itself may have been written much earlier, though Enid Blyton was writing right up until 1975, and it’s not easy to find the years in which specific short stories were published. Enid Blyton was well-schooled in a kind of superstitious mysticism which she made great use of in her fantasy stories. Fairies, goblins, pixies, brownies, witches, portals into other lands… In this story, she makes use of a very old superstition surrounding the number 13. What’s the basic back story of this unlucky number? Oddly, superstition around the number 13 derives from various unrelated cultures around the world, not just one. This may have something to do with lunar-solar calenders, in which there are 12 point something ‘months’ per solar year. This gives a culture 12 ‘months’ plus a bit of a month (the thirteenth) per year. The number 13 may rather disturbingly be linked to a form of ancient misogyny: In ancient cultures, the number 13 represented femininity, because it corresponded to the number of lunar (menstrual) cycles in a year (13 x 28 = 364 days). The theory is that, as the solar calendar triumphed over the lunar, the number thirteen became anathema, because (obv!) periods are evil. In modern times, even people who actively avoid the number 13 probably don’t really think of that reason, but superstitious types still manage to find reasons to believe that there is something inherently wrong about the number. 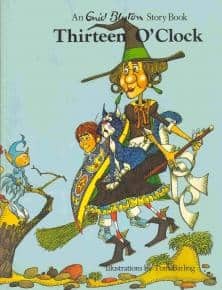 Other authors have taken the number 13 and used it in a plot device for genres such as thriller and horror, but Blyton, in writing for children, pairs this rather sinister tradition with the childlike tradition of blowing dandelion ‘clocks’ in order to tell the time. (Blyton had no significant qualms about refusing to use literature as a conduit to a rounded scientific education.) In Blyton’s story, ‘once in a blue moon’ means that the blue literally turns blue. The thing I loved most about this book was the thing I also loved about the Faraway Tree series, in which Blyton’s wood whispers ‘Wisha wisha’ as the wind blows through the trees. This phrase gave me a deliciously thrilling feeling as a young reader. In Thirteen O’Clock, Blyton not only encourages word play with phrases such as ‘Hoona-looki-allo-pie’ but has created another marvellous phrase of frisson: ‘The witches are coming! The witches are coming!’ This had me hiding under my blankets. What makes the illustrations in this book seem distinctively from the 1970s? The 1970s was a decade wedged between a time of great printing advancements, with the widespread introduction of colour printing in the 1960s, and the beginning of digital illustration used (at least for some parts of the process) by many illustrators working today. Illustrators were working in colour, but they were also drawing and painting by hand. It was in the 1960s that a new type of picture book emerged — those in which illustrations dominated the text. This particular book isn’t one such example — in fact, this book is more accurately a richly illustrated short story, since the story can exist in its own right (and indeed does, inside various anthologies) without these pictures. One thing that makes Tom Barling’s illustrations seem specifically 1970s is the strong use of line. Another illustrator working around this time was Pat Hutchins, who published Rosie’s Walk in 1968, just a few years earlier. In Rosie’s Walk, too, the influence of folk art is strong; line exists not only to add form and shadow to objects but also to act as a decoration in its own right. In Thirteen O’Clock, likewise, there is no attempt made at any kind of aerial perspective; leaves on a tree in the distance are depicted in detail, even though the unseen viewer is too far away from that tree to realistically perceive anything more than a green clump. To provide some rest for the eyes, Barling was making good use of white space — as modern illustrators are still doing today — the roads and the sky are white, and there is an area of blank reserved for the text on every double spread. Here the table is white, to offset a highly ornamental kitchen background. 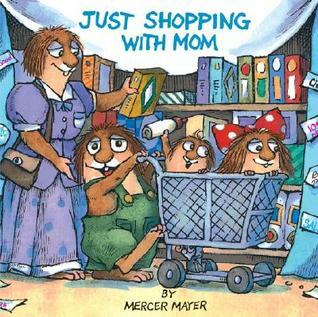 The mother is dressed in a prairie dress, the main character wears overalls, and little sister has a big bow on her head. It is still very common to designate female children as ‘other’ by plonking a big bow on their heads. The historical view of witches is that they are not quite women. In art history, many witches are genuinely unattractive in a reproductive sense, either because they’re very old or because they make no effort to present themselves as alluring, and probably both. 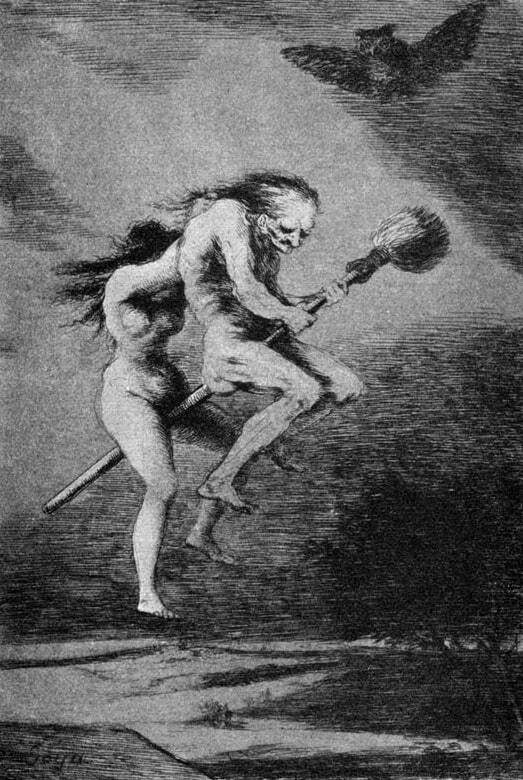 Francisco Goya’s depiction of witches going to Sabbath on a broomstick, 1798. By the 1970s, the nature of folkloric witches in the West had evolved to the point where witches were often depicted as feminine women, but the grotesque mismatch between unattractive essential witchness is made more stark by their feminine style choices. Barling’s witches might also grace the pages of Dahl’s chapter book, The Witches, published about a decade later; their faces are asymmetrical and their noses and chins are comically masculine, but these witches wear lipstick and earrings, and have their hair styled into layered bobs. Extratextual musings aside, Blyton’s imaginary world has no layers; everyone is exactly how they appear. So there you have it: an anti-bigotry moral from an author who was quite well-known for her xenophobia. It’s clear reading this book in 2015 that publishers of picture books sometimes had a few lessons to learn in this new era of double-page colour spreads. It’s hard to find a professionally produced book these days in which the illustrator has been schooled in avoiding placing characters’ faces right where the gutter goes. Illustrator Tom Barling was born in 1936, and illustrated a few of Enid Blyton’s stories over his career. He had a varied creative life as author of eleven crime novels about gangsters. Tom Barling is also well-known as a comic illustrator and an animator on the 1973 TV series of The Addams Family. If you look for books hoping to find more of his illustrations, though, you’ll find most of them seem to be out of print. 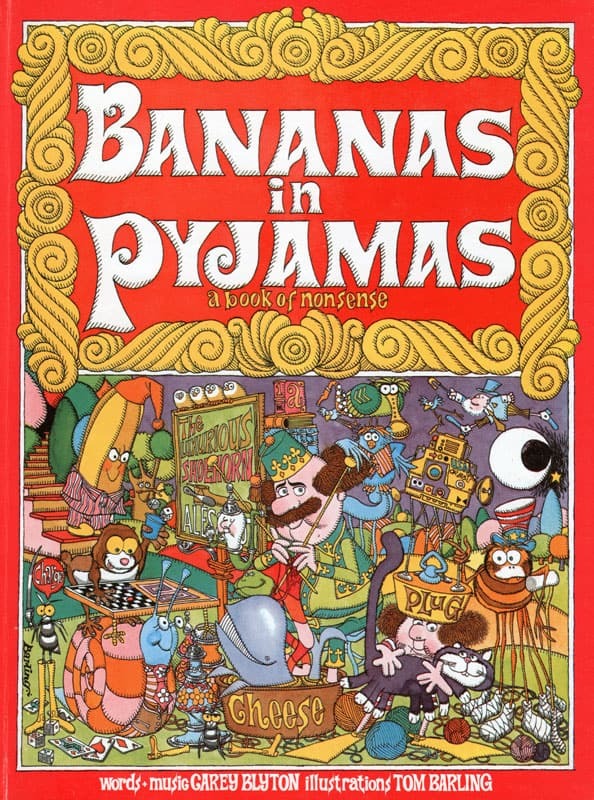 However, did you know that Bananas in Pyjamas is not just an irritating but super popular Australian children’s show but was originally a book written by Enid’s nephew, Carey? That was also illustrated by Tom Barling. But it wasn’t nonsense, was it? Sandy always puffs the time on all the dandelion clocks he sees now — perhaps one day it will be thirteen o’clock again! The message here for children is to cling on for dear life to childhood, because the world of adults is devoid of magic. This sort of plot might be compared to a book for children written by Richard Dawkins, presumably as an antidote to stories such as these. 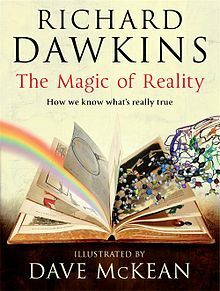 The Magic of Reality is a fantastic book and I wish every child in the world would read it as they embark upon the study of high school science. But I think there is room for fantasy; clearly, some forms of fantasy are simply better done than others — fantasy which tells readers something about the real-world is the most valuable, and fantasy which urges children to believe in fairies even after the story is over is perhaps the laziest way of ending a story. However, Blyton was nothing if not prolific, and her stories were written in the oral tradition. It is therefore up to the adult co-reader to read this story with a nudge and a wink. If fantasy stories for children are to do anything other than entertain — and pure entertainment is a satisfactory goal, no mistake — we must aim to pull readers out of a fantasy world with something to ponder. An io9 article outlines how reading Harry Potter has been shown to make readers better people. …because Potter is continually in contact with stigmatized groups. The “muggles” get no respect in the wizarding world as they lack any magical ability. The “half-bloods,” or “mud-bloods” – wizards and witches descended from only one magical parent – don’t fare much better, while the Lord Voldemort character believes that power should only be held by “pure-blood” wizards. He’s Hitler in a cloak. Is this partly what makes the Potter books so popular, even though scholars of children’s literature struggle to put their finger on exactly why H.P. took off while many recent ancestors of the series which seem just as adeptly written muddle along with middling sales? 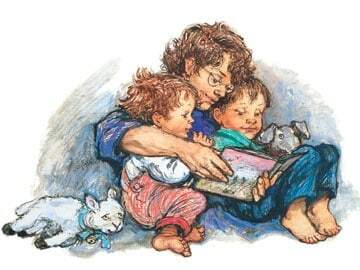 How to leave the preschool reader a better person by making use of fantasy in a picture book? That’s your ultimate challenge.